Download it here from the optimization section. Once you've analyzed your workbook for columns which are slow to calculate, and taken a look at Profiling your user defined functions , before you go the trouble of designing a focused profiler, this autoprofiler will get you up and running quickly to see where the choke points are. I had the following in mind while putting together this capability. Include as an add-in, not as part of your project, and dont add it to any menus or ribbons. Still have access to the profling objects if wanted. Generally speaking these have been met, except that you do have to add a reference to your project for it all to work. 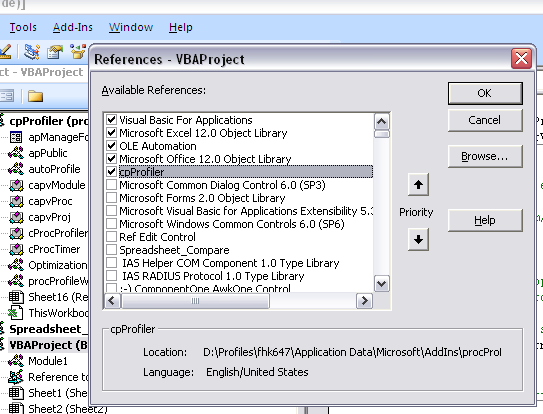 This is necessary to allow the autoprofiler to access classes in the add-in , which should show in your VBE as a separate project named cpProfiler. 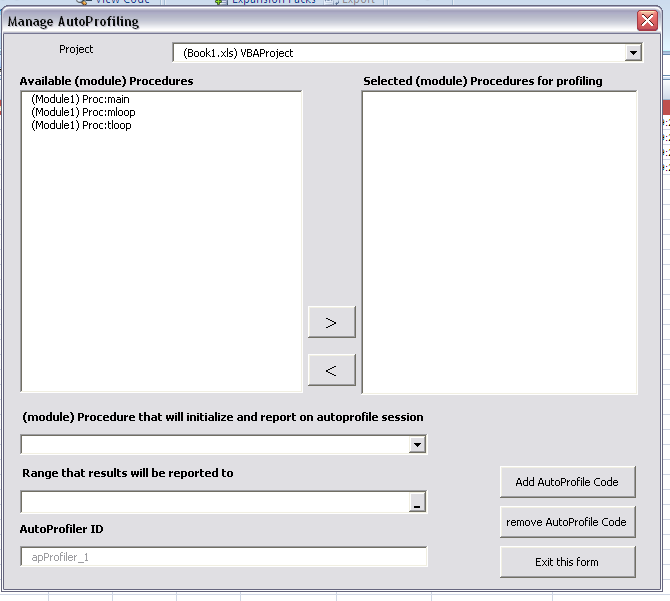 You will find the form to kick off the autoprofiling form in that project, under the apPublic module as below. I purposely did not add it to any menu bars in your sheet to keep it as clean as possible. I will not go into the details of the actual profiling here, as that has been all covered here. As usual we are trying to get a report on the activities of our procedures that would look something like this. The first step is to introduce profiling code into your project, except rather than doing it manually we are going to generate profiling code and insert it into your procedures that will be executed alongside them. An existing output range to write the results to. "remove Autoprofile Code" restores it to its former state. You will notice that there are various notes in the comments of each of the profiled lines. Do not modify these. When you start the form up again, the autoprofiler analyzes these to establish what you had previously selected and recreates your choices. These comments are also used to help clear autoprofiling code when no longer needed. You can get rid of all profiled code with the "remove autoprofile code" button on the form. cProcProfiler - an instance of this class is created for every profiler.